Call it on-demand economy, sharing economy, gig economy, freelance economy, peer economy, access economy, or instant gratification economy – sharing of resources accessible instantly is the fundamental change occurring that might well make the concept of ‘owning’ obsolete in few years. And specialized independent human capital aka freelancers are the main beneficiaries of this change, served on freelancing platforms that are democratizing the way businesses would engage with talent in 21st century. The ‘uberisation’ of everything right from cabs to clothes including meteoric rise of freelancers in Silicon Valley, thanks to smartphone penetration and start-up boom, has cascaded onto the Indian ecosystem. Freelancing today is no more considered to be the poor cousin of a full time job, done mostly by people in the creative space or by those who are ‘unable’ to find a job for whatever reasons. Freelancing is now being seen as a catalyst to micro entrepreneurship where people lend their skills and talent to businesses, (particularly start-ups and small businesses), grow their network, get more exposure, tap on diverse opportunities, and earn an equal handsome amount of money. Hiring freelancers for a specific project especially for start-ups help drive time and cost efficiency by avoiding multiple days of time taken to hire right employees and overhead costs in giving provident fund, training, physical office space, IT etc., particularly because their existence for initial few years remains uncertain. Raghu Vohra, Founder of US-based early stage venture fund Blackstone Valley Group, feels platforms like Truelancer fills in a significant gap between the educated youngsters entering the job market and the available traditional job openings for them. “It gives a platform to youth looking for ways to get into the workforce ecosystem. More importantly, mothers and housewives,retirees, hobbyists, artists, etc., can look for income sitting at home,” says Vohra. Vohra along with other angel investors in the US and India invested seed round in Truelancer in November 2015. However, job mindset and trust factor are the two issues holding back the sector, though it will eventually go away! “There are two major challenges that need to be looked at. First is to get more employers and motivate companies to change their traditional mindsets on how jobs are completed. Second is to build trust of their clients. To overcome these challenges it is important to follow strong quality control and feedback mechanisms,” says Arjun Dhawan, President and CEO, HCC Infrastructure Company. 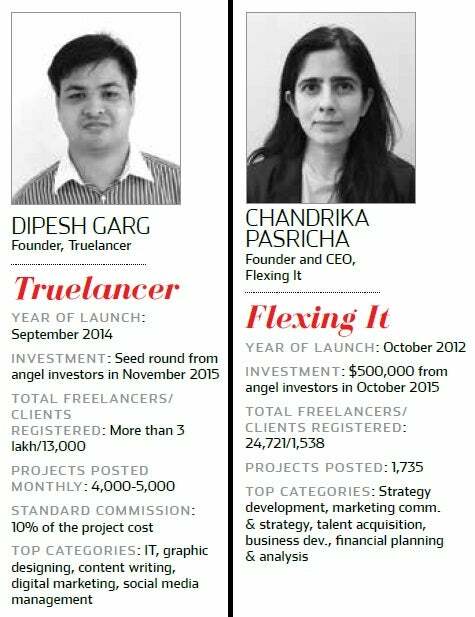 Dhawan along with other angel investors put $500,000 in freelancing platform Flexing It in October 2015. Working for a mobile app development company in Mumbai, 28-year old Anjan Das’s first brush with freelancing was in August 2014 when he was referred by his friend to a travel start-up looking for an app developer. Das till last year end had offered his services to 10 projects via different platforms like Freelancer and Croogster, and earned around Rs 2 lakh per project lasting for 30-45 days against his annual salary package of around Rs 6 lakh. Das left his job in June last year and became a full time freelancer. However he cautions against the delay and low quality work for those turning to freelancing to make sure one keeps getting projects in a timely manner. “While freelancing gives freedom to choose work, time and place, you can’t have a casual attitude towards it. You still have to be professional in your approach and adhere to timelines and quality required in order to get new and repeat clients,” says Das. Once the client posts a project, he/she can choose from the matching freelancers’ profiles for the job or can pick one from the suggestions made by the platform. Typically every platform ranks freelancers based on the feedbacks or ratings given by clients for the work done. The duration and cost are then worked out between the client and the chosen freelancer even as failure to complete the project without a valid reason red-flags the freelancer’s profile. “We have a proprietary matching algorithm called FlexScore that matches freelancers with relevant skill sets to the clients’ requirements. We also have a fee benchmarking tool called FeeBee, as lot of clients don’t know what to charge in freelancing for a project. FeeBee tells clients what should be the price range for a particular project,” says Chandrika Pasricha, Founder and CEO, Flexing It and a former independent consultant in the social sector. The platform only focuses on management functions and works with freelancers having 7-10 years of experience. The projects posted are approved internally by Flexing It before they go live. Freelancing platforms release the money (taken in advance from the client) to the freelancer once they confirm client’s satisfaction withthe project. “The project is sent to the client for review three times in case of any rework. 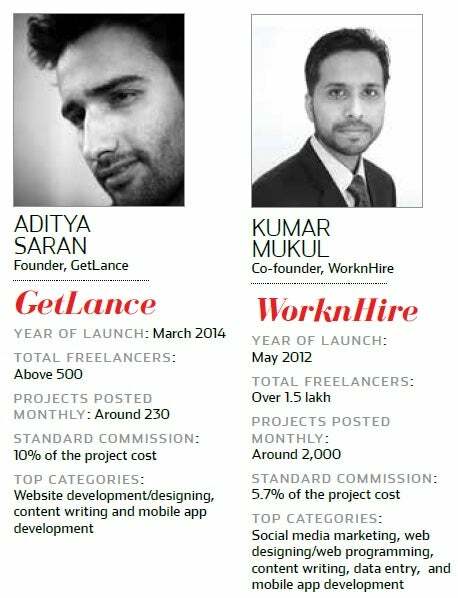 If the client still remains unsatisfied, then the money is returned,” says Aditya Saran, Founder, GetLance. So perhaps, how would freelancing expand its scope in next five years? Would it be limited by size and duration of the project? “There will be more contractual positions which will be for niche field freelancers like consulting projects. Also, there would be a demand to hire large number of freelancers for a project, for e.g. 1,000 freelancers for a data entry project. If freelancing industry could meet such mammoth needs, then it would grow much bigger,” says Kumar Mukul, Co-founder, WorknHire. But, it still means that companies would keep their core team in place instead of expecting that freelancing would replace the entire job structure. This eventually will not happen”. This Freelancer Works 3 to 6 Jobs at Any Given Time. Here's How She Manages It All.